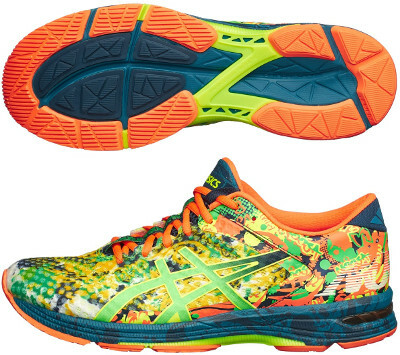 Asics Gel Noosa Tri 11 are stability performance running shoes. The fancy Asics Gel Noosa Tri 11 updates the most extravagant model among not only performance running shoes with pronation support but the whole range available out there. Pretty popular for triathletes (seamless lining inside for sockless running, tongue which prevents slipping down and elastic laces capable) and also as casual shoe, it shares platform with its popular relative the Gel DS Trainer 21 but features less stability because of softer heel counter. Upper has been renewed from its predecessor the Gel Noosa Tri 10 by simplifying forefoot's configuration for great comfort and improved breathability. Upper is stitched around an EVA board and directly attached to the midsole for more stability. As usual, several reflective elements from 3M® remains to enhance visibility under poor light conditions. Rest of Gel Noosa Tri 11 remains unchanged with light and reliable Solyte® midsole with rear and forefoot GEL® for durable and comfortable cushioning. There is a double density medial post (Dynamic DuoMax® foam) in order to correct pronation and the well known TPU unit (Propulsion Trusstic®) in the midfoot for enhanced response and gait efficiency. Outsole features AHAR placed in most exposed areas for longer durability and a special blend of organic and non-organic components (codename WET GRIP®) designed to improve grip even on wet surfaces.